This 1987 Mercedes-Benz 300TD was purchased new at Rasmussen Mercedes in Portland, Oregon and belonged to one owner until recently. It has reportedly been regularly maintained throughout its life and includes complete service records from new. 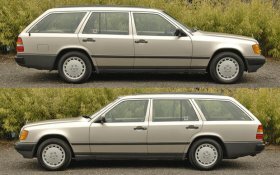 The selling dealer states that 2, 679 of these wagons were imported to the U.S. for 1987, and this example retains its OM603 turbocharged 3.0 liter inline six-cylinder diesel engine mated to an automatic transmission. This Mercedes is now being offered by Cascadia Classic in unmodified condition with all service records, factory books/manuals/tools, an accident-free AutoCheck report, and a clean Oregon title in the prior owner’s name. 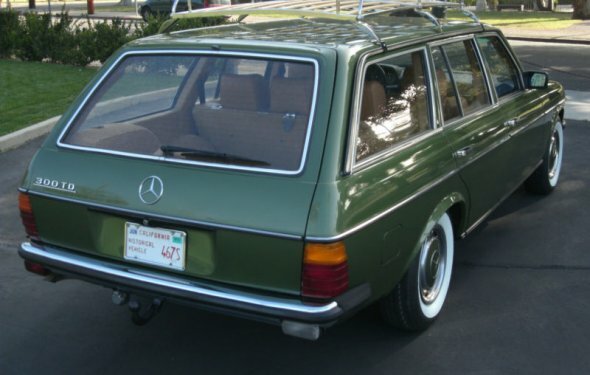 Outside, the seller states that this 300TD retains all of its factory paint, glass, and trim. One ding is shown below the driver’s tail light and a corresponding scuff in the bumper as highlighted in the photo gallery below. Factory 15″ alloy wheels are wrapped in matching Michelin MXV4 tires. The trunk-mounted spare wheel/tire appears to remain unused per the seller as shown in the photo gallery. All features are said to be in good order including the sunroof, power accessories, climate control, and air conditioning. 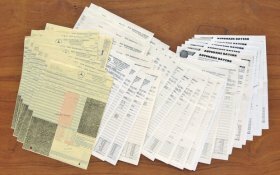 The seller states that the odometer stopped working at 92k miles in 2005 according to the service receipts. The odometer was repaired by the seller prior to this auction, and was set at 116k miles based on pre-2005 service receipts showing the owner’s annual mileage accumulation in the years past. True mileage cannot be confirmed. 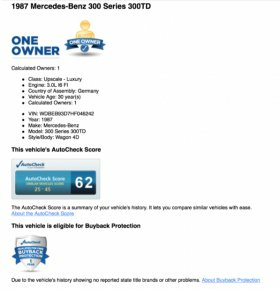 The AutoCheck report shows the last mileage recording at 92k and doesn’t show any odometer discrepancies. 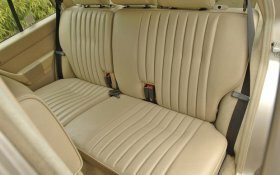 Similar to the cabin up front, the middle and rear seats look to be well preserved. 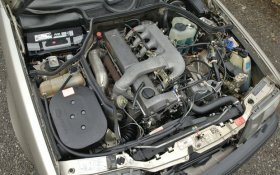 Power comes from an OM603 turbocharged 3.0 liter inline six-cylinder diesel engine mated to an automatic transmission. Complete service records indicate regular servicing from new, and the oil was recently changed. This TD has no known mechanical needs per the seller.